Today I found a bounty of chickweed Stellaria media (L.) or common chickweed that decided my last year’s garden was the perfect place to flourish. I quickly gathered up over a bushel of these beautiful little plants and they are now drying in my shed and will soon be ready to be infused in grapeseed and olive oil which I use in making herbal salves. And I also saved some for adding to salads and soups for an invigorating spring addition to our meals! Chickweed is an excellent plant for skin both internally as a demulcent and externally as an emollient. 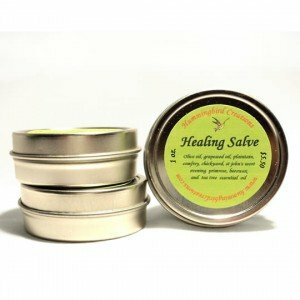 It has a cooling and drying effect on wounds and skin eruptions and helps sooth and heal minor burns. This is why it is one of the important ingredients in my Healing Salve! Chickweed is also an astringent that works wonders in drawing out splinters. Applying either the fresh juice on a cotton swab or dabbing the area with diluted Chickweed Tincture serves to push out slivers without the trauma of tweezers or needles. And it also helps heal the wound left behind. And a cool compress of chickweed is an excellent treatment for varicose veins and hemorrhoids. 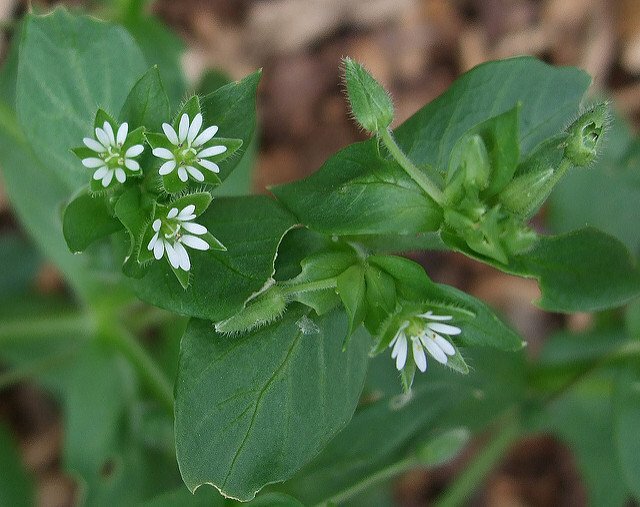 Chickweed is a nutritious diuretic as it replenishes the body with valuable trace minerals and vitamins as it flushes water weight from stored deposits and can be of considerable help to people who struggle with congestive heart failure or obesity. Water retention as witnessed by swollen ankles or bloating is eased by this herb. An excellent spring tonic would include chickweed, dandelion and parsley. All three of these herbs are also rich sources of vitamin C and potassium and chickweed has the extra value of being high in vitamin B complex. Appearance: Small ground-hugging, green herb with heavily branching stems. One line of “hairs” on side of stem which switches with the other side of the stem after each leaf node. Leaves are opposite on the stem joint and the flowers are white and very delicate. Young leaves emerge close to the stem and then develop leaf stalks as the mature.